The realities of staging the Isle of Vashon TT are very complex. This article will try and shed some light on the philosophy that drives the VME leadership to take the course they do concerning the release of the date for this premier Northwest old bike event. While the Vintage Motorcycle Enthusiasts is a not-for-profit motorcycle club the Isle of Vashon TT is our money making event. It's hard not to make a few bucks on a popular event when volunteers commit their spare time to provide the essential skilled labor that actually makes the show go. We don't make a killing but it does help supplement a dues base that produces an excellent club newsletter and other club activities. The dues base and proceeds from Vashon underwrite production of the next year's TT. Proceeds from the event have also contributed to the club Building Fund that, when put to it's intended use, will establish a permanent club facility dedicated to the "...restoration, preservation and enjoyment of vintage, classic and antique motorcycles." In short, the club is pretty straight forward concerning the economics of staging the event. We charge a fair price for a quality product, make a modest profit when the weather is good and accept the full liability if the weather damages attendance as it has in the past. With the economics in focus a key element to continued success of the Vashon TT is the ability of the VME leadership to insure the future of the event. The decision to only release information to the members of the VME is your leaderships attempt to give you the power to control the event by whom you invite. It is the considered opinion of most of the leadership that over promotion may potentially threaten the future of the event. That the club chooses not to further release the date is due to the problems experienced in the past. Years ago when the event was promoted outside the club the Island was overrun with non-members and non-participants who, in many cases, saw this "Old Bike Rally" as an excuse to flagrantly break the law and thereby endanger the event. Thus the "secret" date, although the date is really not secret. It is, however the property of the membership of the VME, the sanctioning body of the "TT". Release of the date to the membership is all that has been authorized by the club due to the negative effects discussed earlier. Whether a member wishes to release the date further is subject to their discretion although the club believes that the membership, by and large, supports the current policy and applies proper discretion when releasing the date to non-members. The invitation most likely will also encourage the invitees to bring out those old and odd bikes. Alternative suggestions about how the club could manage overuse of the event (different time of the year, different location, middle of the week) misses the central point. The essence of the Isle of Vashon TT is its location and current logistics. 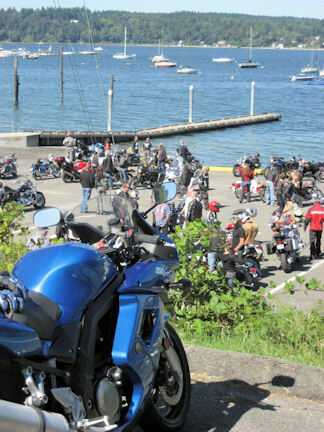 With about 60 volunteers the VME stages a major "old motorcycle" event on an entire island in Puget Sound. Careful planning and a little luck has prevented the residents and the bureaucrats from shutting down or severely curtailing the event. This is a testament to the quality and the method in which the club manages the affair. Secret date? Hardly, join the club - know the date. Unlike some motorcycle clubs we do not restrict membership. In fact the name of the club was carefully considered to project an atmosphere of open enjoyment of motorcycling. Being enthusiasts our membership is not restricted due to type or age of ones motorcycle. In fact motorcycle ownership itself is not required. All we require is an enthusiasm for old bikes, the history of motorcycling and a respect for whatever form such enthusiasm is expressed. Literally anyone can sign up, pay their dues and be fully informed about the VME and it's events. The officers of the VME hope the motorcycling community understands that we take our responsibility to the membership very seriously. 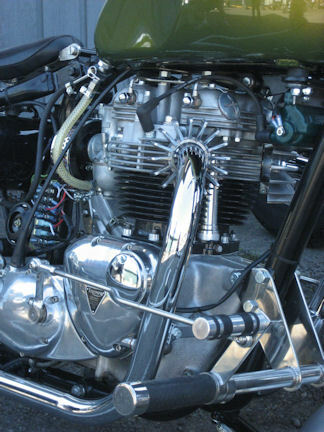 Your VME leadership is committed to exercising the good judgment that will insure the future of the experience that is referred to as "one of the most popular (old motorcycle events) in the Northwest."